Forget the boat, the garden, the picnic, the barbecue. Don’t open the curtains or answer the phone. Sit down at your desk and click on The Great Taxonomy of Literary Tumblrs: Round Two. In case you’ve been sleeping, Tumblr allows users to post text, photos, quotes, links, music and videos. It puts a visual face on just about everything and allows users to display their obsessions — er, interests — for all to see. Over at The Millions, Nick Moran has put together the second list of his favorite literary Tumblr accounts. Organized into categories (humorous, publishers, bookstores, authors, libraries, etc. ), this list of links takes you to Tumblr after literary Tumblr. It’s enough to inspire just about anyone and certainly enough to keep you out of the fresh air over the long weekend. But just in case it’s not, you can always visit Nick Moran’s first Guide to Literary Tumblrs, assembled six months before the second. ride the bus…read a poem! Betty Scott, poet, editor, writing instructor and a judge for the 2012 Sue C. Boynton Poetry Contest, is currently featured on the World Poetry Reading Series site. Have a look at Betty’s poem, All Aboard the Give It Up For, from her collection-in-process, A Courtroom and a Waterfall: Odes to the Spirit, and read more about the World Poetry Festival, held each May in Richmond, B.C., Canada. National Geographic says, “A bioblitz is an event that focuses on finding and identifying as many species as possible in a specific area over a short period of time.” Over the course of 24 hours, August 24-25, scientists, students and curious nature-lovers carried out the sixth annual bioblitz of Rocky Mountain National Park, in Colorado. Along with the flora and fauna, this year’s bioblitz includes poems! Fifty Colorado writers each focused on a single species. The resulting works will be published by Wolverine Farm Publishing, but meanwhile, read Wood Frog (Rana Sylvatica) by David Mason, Bear Grace by Laura Pritchett and Clade, Landscape with Thamnophis elegans vagrans, Contopus sordidulus, and Homo sapiens sapiens by Jake Adam York. The Tang of Nasturtiums, a collection of tanka, has been published by Snapshot Press in the UK as an e-chapbook — one of eight winners in the Snapshot Press eChapbook Awards 2011. 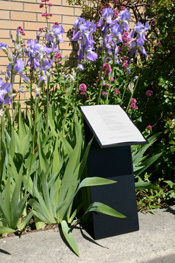 Poet Carole MacRury is a 2012 Sue C. Boynton Poetry Contest Walk Award winner for her poem An Intimate Look at a Slug. View and read the winning chapbooks, including Carole’s, here. A poem cannot be seen to strain after profundity; it must arrive like an astonished, unerring sleepwalker.